Emeco has teamed with London designers Barber & Osgerby for the first time to produce a stacking chair made from a specially developed recycled plastic. Launching at the Salone del Mobile in Milan next month, the collection comprises a chair and two stools made from recycled PET bottles. The lightweight design, named On and On in reference to its ability to be continually recycled, is built around a circular seat that can be stacked rotationally to form spiral towers, and shows the brand making a commitment to the circular economy. The collection is made using a recycled PET material called rPET that the brand first began working with in 2006 for a collaboration with Coca-Cola. The material was made out of fibreglass mixed with discarded PET drinks bottles and resulted in a chair, which was launched in 2010. Since then, the material has been refined so it is stronger and contains a higher percentage of recycled bottles. Today it is totally circular, meaning that it can be endlessly recycled so that new chairs can be made from old chairs. Emeco CEO Greg Buchbinder asked Barber & Osgerby to design a new chair, specifically with recycling in mind, that has the aesthetic of a classic cafe chair, with a round seat that allows for rotational stacking. "Barber and Osgerby balance technical expertise, innovative thinking, and poetry," said Buchbinder. "Edward and Jay's idea for 'On and On' – a timeless, durable chair with a round seat that stacks up in a circular way – is the perfect fit for our newest engineered version of rPET, a recycled material that can be recycled again." 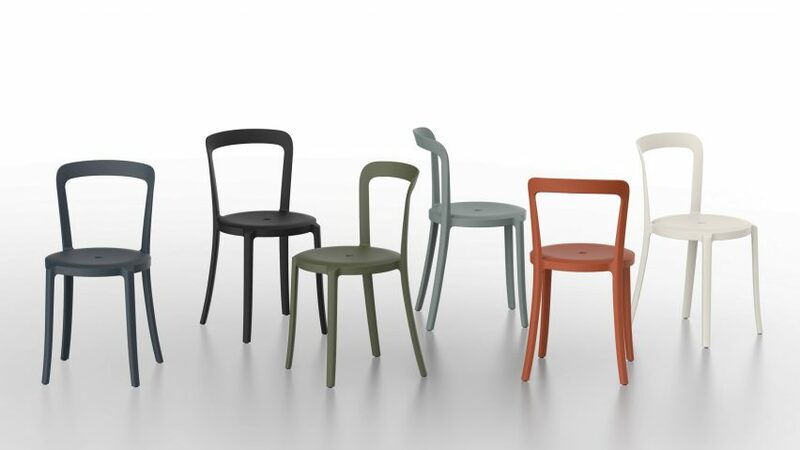 The composition of each chair is mainly recycled PET bottles with 20 per cent fibreglass to ensure strength, while the colours are all obtained naturally, with the black chair colour coming from car tyres. The innovative material allowed Barber & Osgerby to create chairs and stools with the minimum amount of material, that are both physically and visually lightweight, but with the resilience required for both commercial and domestic settings. "The chair has been designed to use as little material as possible, making it extremely lightweight," explained Barber & Osgerby. "The efficient use of plastic ensures lower carbon emissions when shipping, making this chair completely sustainable." The American brand, which is known for its use of recycled and reclaimed materials, was launched in 1944 with the original Emeco 1066 chairs, which were made from recycled aluminium. Last year Dezeen teamed up with French illustrator Jean Jullien and his animator brother Nicolas to create an exclusive film, in which Emeco CEO Gregg Buchbinder tells the story behind five of the American furniture brand's chairs.